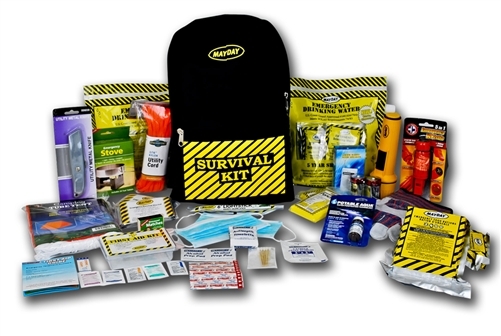 This Deluxe, all-purpose kit is perfect for many emergency situations including earthquakes, hurricanes, tornadoes, wildfires, floods, mudslides and landslides, blizzards, thunderstorms, blackouts, tsunamis, volcanic eruptions and even extreme heat and cold. This Survival Kit contains a complete set of emergency supplies includes: emergency food & water rations, flashlight, radio, portable cooking stove, a tube tent, water purification tablets, a first-aid kit and much more. The food & water rations in this Emergency Kit have a 5-year shelf life. After 5 years they can easily be replaced with products on our site. Also, should you be stuck in your home, you will be able to use your available water sources with the water purification tablets we’ve included. This vitamin enriched, great tasting food bar is approved by the U.S. Coast Guard and the Canadian Transport Department. It has a 5-year shelf life with the expiration date clearly visible for easily determinable replacement. Each bar consists of 2400 Calories which represents a 3-day emergency food supply for one person. Each bar is divided into 6 - 400 calorie segments & requires no preparation. It is safe for vegetarians & those with nut allergies. This ration can be stored in temperatures up to 149 degrees F.
These disposable 3 ply dust masks with a blue polypropylene spun bound outer layer are Latex free, have low breathing resistance, provide 99.5% plus particular filtration, and provide 97.5% plus bacterial filtration efficiency. This unique blend of non-toxic chemicals is formulated to light in wet conditions. Matchbox striking surface is treated with moisture resistant coating.